If you conducted a survey on gender and leadership styles I think most people would agree that men lead with their head and women lead with their heart. But which style is better? When it comes to dating, one of the first rules you learn is to avoid wearing your heart on your sleeve. Everyone knows that in situations when you are still testing the waters it’s better not to lay all your cards on the table. But now that I’ve exhausted enough idioms for one post, which approach is better in business? According to an article in Business Week, leading with your head isn’t always enough, especially in a tough economy. Gaining the trust of your customers and your employees is crucial to having a thriving business. People want to know that they are valued and respected. Even my marketing guru has been instilling in me the importance of this approach in my social networking. You must give, give, give, before you even think about asking for anything. “An effective leader touches hearts and balances that with head practices… to get work accomplished,” writes Jenna Perdue in a similar article where she presents seven tips to finding that balance. 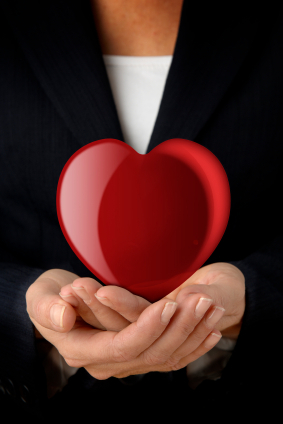 Leading with the heart is one area where women have a distinct advantage over men. As natural-born collaborators, women are interested in the thoughts and feelings of others. They can tune in where men tune out, and can achieve an ideal balance between the analytical and emotional sides of leadership. Creating more holistic work environments and long term relationships, women understand that in business you’ve gotta have heart. This entry was written by Dr. Shannon Reece, posted on October 27, 2010 at 6:00 am, filed under Alphabet of Entrepreneurs, Aspiring Entrepreneurs and tagged authenticity, businesswomen, entrepreneur, heart, strategies for women. Bookmark the permalink. Follow any comments here with the RSS feed for this post. Post a comment or leave a trackback: Trackback URL.